I’ve fallen in love with a new wild flower – well, new to me. 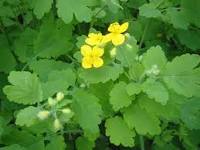 It’s called celandine, and now I’ve learnt it, I keep finding it everywhere. It belongs to the Papaveraceae family (the same as a poppy), and its flowers are a glorious sort of splayed buttercup (with which it has nothing to do). According to my little flower book, the plant was recognised as a handy plant for detoxifying as far back as Pliny The Elder. I smile as I read, instantly fifteen and back in a sweltering June classroom, doggedly translating Pliny (although it couldv’e been Younger), and dreaming of Glastonbury and escape. The memory makes me like the plant even more. The summer I left Twycross (and turned sixteen) was completely enchanted – one long round of sunshine, festivals, parties and watching dawns break. I didn’t sleep in a bed for two months. I tell my daughters the outrageous stories as we wander the lanes of Horley, hunting celandine. We find some tumbling down the Church-Lane side of St. Ethelreda’s, all the stalks shaped upwards like umbrella handles to lift the flowers to the sun. ‘They’re happy flowers,’ says Jess. By far my favourite Celandine place is through Emma’s Bottom Meadow, and onto the Old Railway field. There’s a wide, shallow ditch beneath a Watership Down type ridge (and millions of rabbits). The ditch is edged by reeds, still brownish after the slow Spring, but in the centre of the ditch, hidden until you’re quite close up, runs an enormous swathe of Greater Celandine, defiantly, richly, brilliantly yellow; glowing and so pretty you have to stare for ages. The thought drives me to my feet, and I whistle the dogs, call the children, pull on my wellies. It might be the fact that I’ve two glasses of red and I’m sitting in front of the fire but, I thought that was lovely. I know what you mean, it is one of those amazing things about the internet. I’m typing and people have been asleep for hours. I’m putting on a scarf and someone is picking out a pair of shorts. I love our ‘small world’.